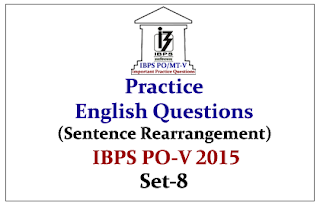 Dear Readers, Important Practice English Questions for Upcoming IBPS PO-V Exam was given here, candidates those who are preparing for those exams can use this material. Directions (Q.1-5): Rearrange the following six sentences (A), (B), (C), (D), (E) and (F) in the proper sequence to form a meaningful paragraph and then answer the questions given below. (A) The RBI has advised banks to form farmer’s advisory committee in all rural branches. (B) These meetings are made mandatory and are to be attended by the controlling official of the bank. (C)With the significant changes the economic environment and the thrust given by the Government of India for doubling of agriculture in the Tenth Five Year Plan, it is important to increase the farmers’ participation in the existing extension system. (D)A branch advisory committee comprising select elected representatives, including women leaders of local Panchayat Raj institutions, within the service area of branch, is established at every rural branch. (E) This committee will play a vital role in rural development and it will not only strengthen the extension system, but will also make it more reliable and transparent by proper planning and resource allocation. (F) It should meet at least once in a quarter. 1).Which of the following would be the FIRST sentence after rearrangement? 2).Which of the following would be the SECOND sentence after rearrangement? 3).Which of the following would be the FOURTH sentence after rearrangement? 4).Which of the following would be the FIFTH sentence after rearrangement? 5).Which of the following would be the SIXTH (LAST) sentence after rearrangement? 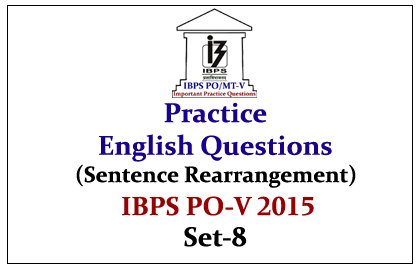 Directions (Q.6-10): Rearrange the following five sentences (A), (B), (C), (D) and (E) in the proper sequence to form a meaningful paragraph and then answer the questions given below. (A) In such cases, services may get affected immediately, as the links to ATMs, POS or other electronic networks are brought down. (C) The consequential costs of a serious systems failure, therefore, can far exceed the costs of replacing damaged equipment, data or software. (D) Particularly damaging effect is on the environments wherein IT is being used for on-online, real-time processing. (E) An insufficient processing capacity to cope with the additional load may also lead to a suspension of the banking facility unless adequate contingency plans have been specified and tested beforehand. 6).Which of the following should be the FIRST sentence after rearrangement? 7).Which of the following should be the SECOND sentence after rearrangement? 8).Which of the following should be the THIRD sentence after rearrangement? 9).Which of the following should be the FOURTH sentence after rearrangement? 10).Which of the following should be the LAST (FIFTH) sentence after rearrangement?